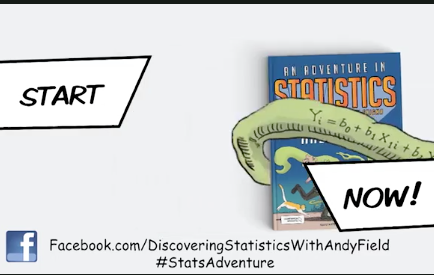 Andy Field goes on an 'Adventure in Statistics': Stacey Bedwell reviews. Andy Field is a well-known statistician amongst psychologists. Field’s light-hearted approach to statistics makes analysis a more enjoyable experience, especially for novices and students who may otherwise find the subject somewhat intimidating. This is perhaps why his previous publication Discovering Statistics Using SPSS continues to be relied upon by so many. Field’s new offering does not disappoint, providing an accessible yet comprehensive guide to a wide range of statistical techniques and models. The cover design of An Adventure in Statistics makes this book stand out from other statistics guides on the shelf. It is also unique in the way it is presented, as a fictional story. The whole book follows a conversation with a student and various characters, with a similar conversational structure to each chapter. Although some readers may find this difficult to follow, especially if using the book to look up small extracts of information, others may find that the narrative makes the complexity of the statistical content easier to follow, digest and perhaps recall in the context of a story. For those not interested in reading the story aspect of the book, Field has designed it so that the academic content is contained within a central ‘section’ in each chapter. However, if you are not interested in the story aspect it may not be worth investing in such a large and heavy book. An Adventure in Statistics contains a large body of vital information in the first few chapters, covering the basics of statistical analysis, data collection and study design. These chapters are often overlooked when reading statistical guides, sometimes leading to problems and misunderstandings later down the line. One of Field’s intentions with his story narrative is to encourage cover-to-cover reading. Although we may not all have the time to do this, for those who do, having the story to follow may make skipping to the detail of specific statistical tests less enticing. Field has introduced an interactive element to An Adventure in Statistics, in the form of questions throughout each chapter. This provides the opportunity to check your understanding as you progress through the book. There is no need for previous knowledge in statistics to be able to use this guide. Field covers all of the basics before moving on to more complex methods and explains everything in easy to understand terms. Field has included information suitable for a range of levels and interests, as well as some methodologies rarely found in general statistics textbooks aimed at psychologists (e.g. Bayesian analysis). Field has succeeded in bringing a refreshing new approach to learning statistical methods, in this easy-to-follow and engaging guide. - Reviewed by Stacey A. Bedwell, postdoctoral researcher, Nottingham Trent University.